The most beautiful painting in the world, Raphaels Transfiguration , belongs not in a museum but in a liturgical setting, the master of pontifical ceremonies and a scholar of liturgy and sacred art recently declared in the Vaticans newspaper, LOsservatore Romano , speaking of a painting that now sits is the Vaticans own Pinacoteca Museum. A work of sacred art placed in a museum, even with the best of intentions and perhaps guarded more safely, loses three quarters of its capacity to speak, wrote Monsignor Marco Agostini. It is a laudable suggestion, but one that raises complicated museological questions. Certainly religious art is most at home in a religious setting, but is a call for house arrest consequently appropriate? The first person to argue that this particular painting should not decorate an altar, it should be remembered, was Cardinal Giulio deMedici (later Pope Clement VII) who commissioned it. He suggested, upon the paintings completion in 1520, that it should adorn Raphaels funeral bier, as the artist died shortly after completing the painting. For most of its existence, however, it has indeed adorned the altar of S. Pietro in Montorio in Rome. But the museum where it hangs now (and it is displayed quite nicely), was also commissioned by a Pope”Pius XI”for the purpose of displaying the Vaticans unwieldy collection of art. However, even if the Pinacoteca was not backed by papal mandate, a case could still be made for the place of religious art in an ostensibly secular museum setting. Museums, so far as I can tell, are in transition. Bravo! Christ rules and reigns forever! Thank you for having the boldness to represent such an exhibit! When one picks up Harvards highly theoretical journal of art and anthropology, Res , one does not expect to read such proclamations. Nor is this an isolated incident. The now legendary 2004 Metropolitan Museum of Art exhibition, Faith and Power , opened with an incense-bearing Orthodox priest consecrating the exhibition, and the catalog begins with a blessing and prayer from the Patriarch of Constantinople. Similar cases abound, as museums attempt to situate themselves in the era following the collapse of the Enlightenment ideals that generated museums in the first place. Whats more, in a city as art rich as Rome, when does one stop? Should we return all altarpieces to their churches of origin? One wonders if the liturgical liberation of Raphaels Transfiguration is tantamount to the inconsistent animal rights activists appeal to save only the adorable baby seals. There is simply too much liturgical art in the world to apply this principle consistently. The ideal, instead, should be a balance between liturgical and museum use, with the latter evoking (not aping) the former. Should circumstances permit, we should welcome the return of liturgical art to its native ecclesial environment, just as we would rejoice to see a caged condor released into a Colorado canyon. But each case is unique, and in the end, it is Raphaels painting itself that suggests a solution to its own placement. Images of the Transfiguration have a long history, one that has been laid out by Andreas Andreopoulos book Metamorphosis . It is arguably the Eastern image par excellence, and the absorbing history of the type cannot here detain us. But Raphaels Transfiguration is different than what came before it. 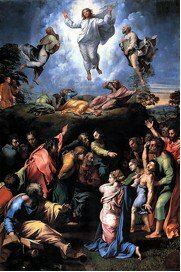 One of the innovations of Raphaels painting was that he united the scene of the Transfiguration with the scene of the demon-possessed boy that, in each of the gospel accounts, immediately follows it. Countless other figures have marveled at the contrast of the upper and lower scenes in Raphaels painting. In his Italian Journey , Goethe saw the painting as an illustration of psychological passivity and activity; in the Birth of Tragedy , Nietzsche used it to illustrate his contrast between the Apollonian and Dionysian modes of art. Taking these Teutonic cues, we might permit the painting further illustrative possibilities: Raphaels Transfigured Christ above gives us an image of the liturgy, which Monsignor Agostini has rightfully prioritized. But the paintings troubled lower tier can represent the frenetic mess of the art world and its troubled museums. The magnificent surplus of Christian art and music”a providential overflow”has a place beyond church walls as well as within them. Raphaels Transfiguration in a museum setting may lose three quarters of its capacity to speak (which education and imagination can do much to restore). But confined to the liturgy, it could lose three quarters of those to whom it might speak as well. Matthew J. Milliner is a Ph.D. candidate at Princeton University. He blogs at millinerd.com . His most recent article for the magazine is The Desert Fathers and his most recent articles for On the Square are The Neglected Fireplace: Protestantism and the Arts and Another Day in Chelsea: Or How I Stopped Worrying and Learned to Love Contemporary Art . For a news story on Monsignor Agostinis remarks see see here and for his article (in Italian) see here . A guide to the Vaticans Pinacoteca . Res: Journal of Anthropology and Aesthetics . The Metropolitan Museums Byantium: Faith and Power exhibit . Christian K. Kleinbubs Raphael’s Transfiguration as Visio-Devotional Program from Art Bulletin (September 2008).